The battle began roughly two years ago when UHW leaders criticized SEIU for negotiating an agreement with nursing home chains that restricted workers’ rights in exchange for limited employer neutrality in organizing campaigns. Relations worsened after SEIU attempted to remove 65,000 long-term care workers from UHW and put them in a new statewide local of nursing home and homecare workers. And UHW further criticized SEIU for accommodating employers to win new members, rather than empowering workers in aggressive, democratic locals. 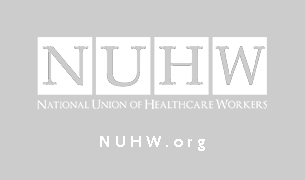 Anaheim, Calif.—Five hundred workers at Western Medical Center in Anaheim and Coastal Communities Hospital in Santa Ana, both owned by Integrated Healthcare Holdings, Inc. (IHHI), filed petitions yesterday for an election to join the National Union of Healthcare Workers (NUHW). LOS ANGELES—Workers employed through a subcontractor at Providence Tarzana Medical Center, who were denied their right to form a union by the Service Employees International Union (SEIU) and Unite Here in a secret deal with the Compass Group, filed petitions today for an election to join the National Union of Healthcare Workers (NUHW). In May, the Wall Street Journal exposed the secret deal between several large corporations and the heads of the Service Employees International Union and Unite Here. Union officials agreed to forbid most low-wage workers who work for Compass, Sodexho, and Aramark from joining either of their unions, in exchange for access to a smaller number of workers at facilities chosen by the employers. The unions agreed not to admit the existence of the agreement to workers or the public.